September 10, 2001. U.S. Secretary of Defense Donald Rumsfeldt stated that 2.3 trillion dollar from the Pentagon’s annual budget could not be accounted for. September 11, 2001, the Pentagon’s accounting office and the Naval Command Center were targeted, allegedly by a plane. Survivors would report about explosions inside the Pentagon prior to the alleged plane impact. During a 2012 Forestall Lecture , Admiral James G. Stavridis noted that he was working as a newly selected 1-star accounting officer at the Pentagon and that he was lucky to have survived. 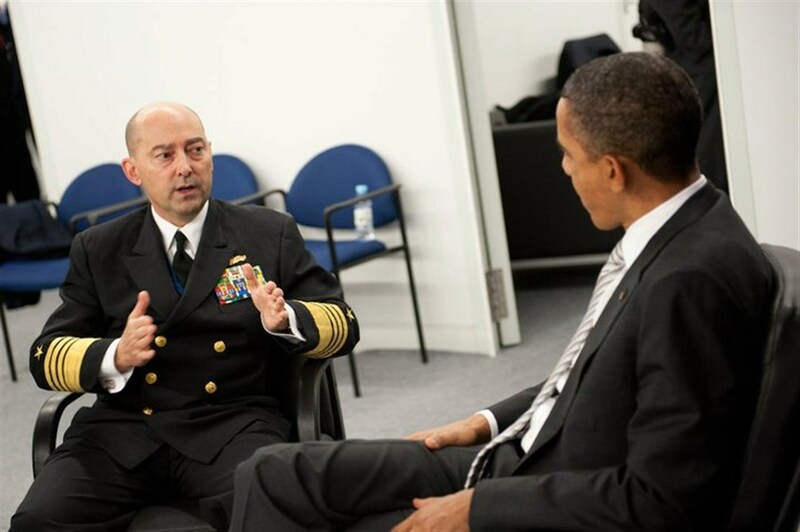 By 2009 Stavridis would have been promoted to the rank of Admiral and NATO’s Supreme Allied Commander Europe. Responsible for NATO’s 2011 military operations in Libya, Stavridis would describe NATO’s intervention in Libya as “a teachable moment and model for future interventions”. On September 10, 2001, Secretary of Defense Donald Rumsfeldt declared a war on waste, stressing that 2.3 trillion dollar from the Pentagon’s annual budget could not be accounted for. CBS quoted Rumsfeld as saying that money wasted by the military poses a serious threat “In fact, it could be said it’s a matter of life and death”. Rumsfeldt would proceed, promising change as of September 11. Indeed, change came on September 11; For many of those who were working at the Pentagon it would literally become a change that cost their lives while it turned into a life or death situation for survivors who were working in the offices which were targeted on September 11. One of these survivors is April Gallop. April Gallop would testify under oath in a two-hour-long, video-taped interview with Barbara Honegger who has conducted an in-depth investigation into the events at the Pentagon on September 11. April Gallop would state that a violent explosion near her desk in Wedge Two or Corridor Five, more than 100 ft north from the official narratives alleged plane impact point stopped her watch at 9:30. April Gallop saw no debris from an aircraft, no seats, no luggage, no passenger’ bodies, nor did she observe any jet fuel. Her watch is kept at a safe location. Gallop would state the she saw fires coming out of computers. Barbara Honegger reports that other eyewitnesses, including Tracy Webb experienced such computer fires at the E Ring of Corridor Four. Ms. April Gallop is in contact with several other survivors who can corroborate her experience but who would need to be guaranteed protection before they could come forward. The alleged plane impact happened at least eight minutes after massive explosions inside the Pentagon. Another clock from the Pentagon that is kept at the Smithsonian as well as photographic evidence prove that other clocks stopped due to explosions before the alleged plane impact. Barbara Honegger’s research would show that “something” struck the Pentagon from the outside too. That object, however, was not a jetliner and struck some 150 meters from the alleged jetliner impact site. Donald Rumsfeldt’s war on waste would turn into the Global War on Terror and lead to the invasions of Afghanistan and Iraq. Information about the missing 2.3 trillion dollar was destroyed on September 11. In 2012 NATO’s Supreme Allied Commander Europe (SACEUR), Admiral James G. Stavridis would hold the Forestal Lecture at the Naval Academy. Stavridis would talk about service selection and about the development of warfare throughout the 20th century. Stavridis would point out that both WW I and WW II as well as the Cold War were wars of walls pointing at the Maginot Line, the Iron Curtain, the Bamboo Curtain, the Berlin Wall. Stavridis would stress that it took “a shocking lesson”, the events on September 11, 2001, to prove that walls don’t provide security in a modern world. Stavridis would point at a wide-screen image of the section of the Pentagon that was destroyed on September 11, 2001, stating that he was working as a newly-selected one-star officer who was “working in the Navy budget world” at the Pentagon. Pointing at the section of the Pentagon that was destroyed on September 11, 2001 he stated “obviously, I am lucky to be able to be speaking to you here today”. An attempt to reach out to the now retired Admiral James G. Stavridis, who is working as Dean of the Fletcher School at Tuffs University remained unanswered. Stavridis would be an important witness. It would also be interesting to know whether Stavridis was working at the Army Offices in the E Ring of the Pentagon or whether he was working at the Naval Command Center (NCC) in the D and C Rings. The NCC was the only Navy office that was targeted with explosives on September 11, 2001. Where was he and what was he working at during the days prior to September 11 and on September 11. How did the newly-selected one-star officer rise to the rank of Admiral and NATO SACEUR by 2009? As NATO SACEUR, Stavridis would be in charge of NATO’s operations in Libya in 2011. Besides questions about his experience during the days up to and on September 11, 2001, it would be interesting to ask James G. Stavridis if he still stands by the words he wrote in that article. That is, that “Libya was a teachable moment and model for future interventions”. Arguably, 2.3 trillion dollar are a seizable start-up budget for wars which have to be waged “off the books”.